The U.S. House on Friday shot down President Obama's bid to negotiate the largest trade deal in American history. The people taking knives to his agenda were in his own party, including most of Texas' Democratic delegation. WASHINGTON – The U.S. House of Representatives on Friday shot down President Obama's bid to negotiate the largest trade deal in American history. But unlike recent chapters in divided government, the people taking the knives to his agenda were members of his own party, including most of Texas' Democratic delegation. The House nixed a measure to give assistance to American workers hurt by a would-be trade deal with 11 other Pacific Rim countries called the Trans-Pacific Partnership. Only minutes later, the House then gave the president authority to negotiate that deal. Unless the two measures are passed together, a trade authorization deal is unlikely to pass the U.S. Senate. Only three Texas Democrats cast votes with the president: U.S. Reps. Henry Cuellar of Laredo, Eddie Bernice Johnson of Dallas and Beto O'Rourke of El Paso. 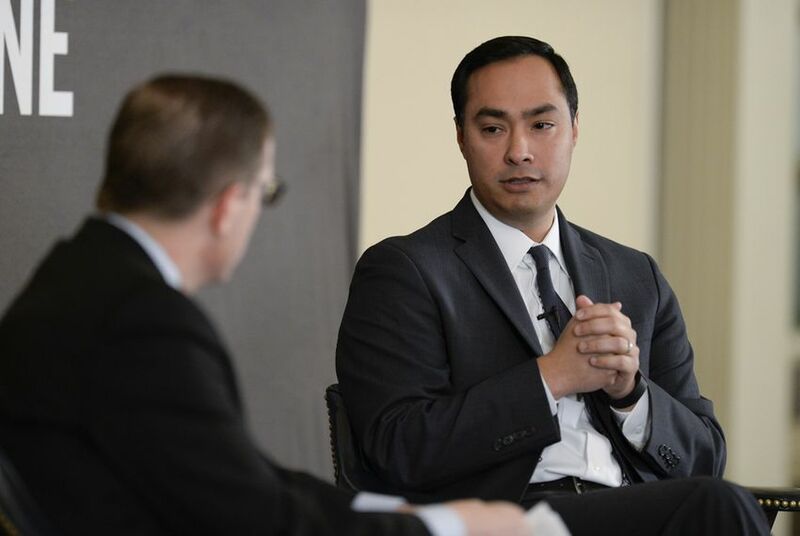 The eight other Democrats, including U.S. Rep. Joaquin Castro — the center of a big lobbying effort — voted against at least one of the measures. "Giving the administration fast track authority would have undermined any chance for Congress to have any meaningful say on the largest trade deals America has ever negotiated,” U.S. Rep. Gene Green of Houston, who voted against both measures, said in a statement. The Senate failed to pass Obama's initial bid to the chamber back in May, only to see it revived in that chamber days later. In the immediate aftermath of Friday's House vote, a White House spokesman seemed to hint on social media that history could repeat itself. The House vote — and the lobbying that accompanied it — exposed deep and slumbering rifts between the Obama administration and House Democrats. Democrats as a whole voted overwhelmingly against the president. "We're going to continue to make an aggressive case to all of the House Democrats, including [House Minority] Leader Pelosi, about why it's important for them to support Trade Adjustment Assistance," White House spokesman Josh Earnest said immediately after the vote. For Democrats, the vote was a choice between antagonizing labor, which was vehemently against the measure, and gutting the president's economic legacy. It was one of the most anxious whip counts of his presidency and, for many House Democrats, the most difficult vote of their careers. The party was so divided on Friday that even Texas' Castro twins were split on the issue: Joaquin Castro joined with most of his caucus to oppose authorization for Obama; his brother, Housing and Urban Development Secretary Julián Castro, favored it, saying at a Houston speaking engagement on Friday that it was "fantastically important." Instead, the president's support came mostly from Republicans, including many from Texas. This was not a vote for an actual trade deal. It was a measure to empower the president to negotiate with foreign leaders and then return to Congress, likely in the fall, for an up-or-down approval vote. Labor reviled the concept, arguing that a trade deal would translate into lost jobs and depressed wages. Unions are a dominant constituent in Democratic money politics. Democratic incumbents found themselves in an increasingly tight squeeze in recent weeks between the president and labor groups. The threats to House Democrats were implicit and explicit: Defy the unions, and they will come after you in primaries. To counter the labor push, the president was more engaged on Capitol Hill than at any other point in his tenure since the 2010 health care overhaul, and the effort consumed the nation's capital in the push's final hours. On Thursday evening, Obama made a surprise appearance at Nationals Park for the Republicans-vs.-Democrats Congressional Baseball Game. Several thousand Capitol Hill staffers were in attendance to watch members, including Texas Reps. Joe Barton, Kevin Brady, Mike Conaway and Roger Williams, who participated in the game. Upon seeing the president on the field, the Republican side of the stadium broke out in cheers of "T.P.A.! T.P.A! T.P.A!," the acronym for the deal. The president glad-handed both dugouts. Barton, the Republicans' team manager, took a photo with the president. The appearance delighted some Democratic members and staffers in attendance. But other Democrats found the president to be engaging in a transparent gambit. Seven years into his presidency, this was the first time Obama attended the baseball game as commander in chief. Some Democrats in the crowd perceived the charm offensive as "too little, too late." The president then traveled to Capitol Hill for a Friday closed-door meeting with the Democratic caucus to make his final plea. There were many conservative Republicans who supported the policy on its face, but loathed giving the president any executive power. All in all, Texas Republicans voted for the trade deal, but not the assistance measure. Capitol Hill Republican staffers credit House Ways and Means Chairman Paul Ryan, R-Wis., with shepherding the legislation through the House, albeit unsuccessfully for now. But Texans helped with the effort: U.S. Sen. Ted Cruz co-wrote a Wall Street Journal op-ed with Ryan in April, and U.S. Rep. Jeb Hensarling, the House Financial Services Committee chairman, wrote his own National Review opinion piece supporting the president's authorization.